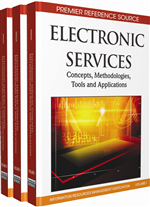 Several measurement scales have been designed by both practitioners and researchers to evaluate perceptions of electronic service Quality. This chapter tests three of the main academically developed scales: Sitequal (Yoo & Donthu, 2001), Webqual 4 (Barnes & Vidgen, 2003) and EtailQ (Wolfinbarger & Gilly, 2003) and compares them against the scale ensuing from our research: NetQual (Bressolles, 2006). Based on 204 evaluations of consumers that participated in a laboratory experiment involving two Canadian Websites in travel and online insurance, NetQual best fits the data and offers the highest explanatory power. Then the impact of nature of task and success or failure to complete the task on the evaluation process of electronic service quality and attitude toward the site is examined and discussed on over 700 respondents that navigated on six different Websites.